Fresh off winning the Big West regular season championship in the season finale against UC Davis last Saturday, the UC Irvine men’s basketball team’s focus must quickly shift towards the conference tournament tomorrow night where they have earned the first seed and a 6:00 p.m. date against eighth seeded UC Riverside. The ‘Eaters (19-13) won the series against the Highlanders (7-20) in conference play with a 79-60 victory at Bren Events Center last month and a 68-56 win most recently at Riverside. This past monday, the ‘Eaters received a number of nods from the Big West including Player of the Year (Luke Nelson), Coach of the Year (Russell Turner), Defensive Player of the Year (Jonathan Galloway), and an all-conference first team and second team honor to Jaron Martin (13.9 PPG) and Ioannis Dimakopoulos (11.4 PPG, 52.5 FG%) respectively. Nelson, who played in only 14 games this season, averaged 17.2 points per contest shooting 47.3% from the floor and 44.8% from deep — enough to earn him a spot on the all-conference first team alongside Martin. The senior also earned his second Big West Conference Athlete of the Week recognition for averaging 25 points, 4.5 rebounds, and 2.5 steals in the last week of the regular season. Coach Turner’s bunch earned a 12-4 conference record to give them their third regular season title in four years. UCI is on a roll as they have won 14 of their last 18 games heading into the tourney. 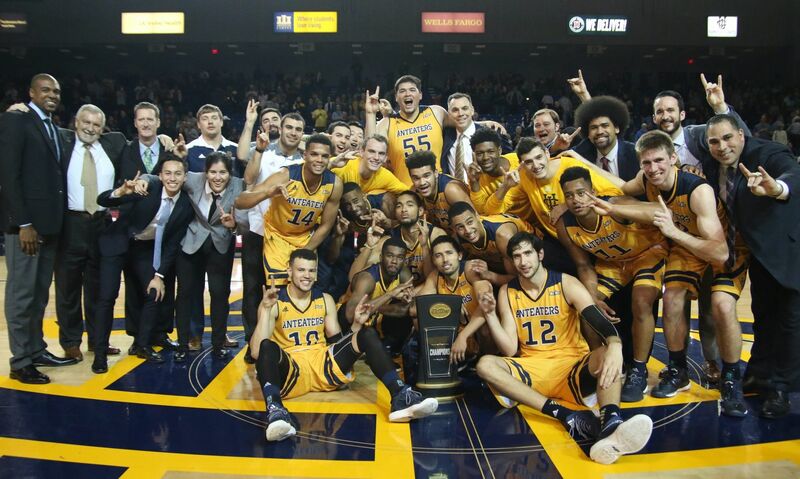 The ‘Eaters last won the conference tournament back in 2015 when they went on to face 13th seeded Louisville in the program’s first ever trip to the NCAA Tournament. A win against Riverside would make it five straight seasons where the ‘Eaters won 20 games. UCI’s quarterfinal matchup will be at the Honda Center in Anaheim and will be televised on Fox Sports Prime Ticket (10 p.m. tape delay).